Tidings of comfort and joy have never looked more beautiful than they do in this exquisite 9¼"x3¾" pop-up card. 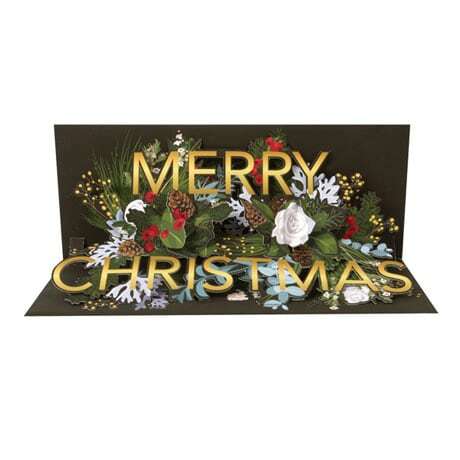 Sprigs of flowers decorate the simple exterior, but inside, an exuberant 3D display of holly, white roses, pine cones, and lush greenery bloom around the gleaming foil message "Merry Christmas." Pull a small tab to hear a few bars of "We Wish You a Merry Christmas." The back of the card offers space to pen your own season's greetings, and two paper tabs prop the card open so it can be displayed on mantel or tabletop throughout the holiday season. Additional postage required.